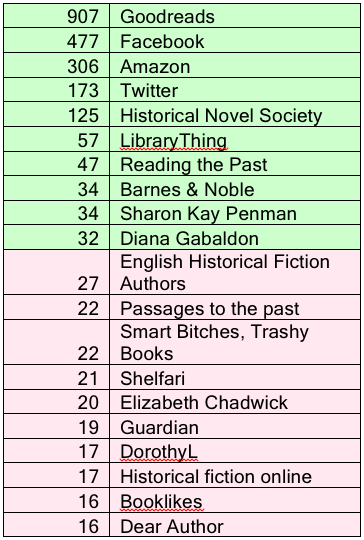 Goodreads is way out in front with 907 mentions followed by Facebook, Amazon, Twitter and Historical Novel Society. Interestingly, when readers mention Facebook they often qualify their response by mentioning a favourite group, author, fan page or the Facebook page associated with a blog. Compared with 2012, Twitter has leapt ahead and I am delighted to see the Historical Novel Society featured so strongly. Over 675 sites were mentioned. That’s an amazing number of sources for readers to peruse! When I have more time, I will attempt to aggregate some of the numbers so I can report on different categories such as small book review blogs, sites dedicated to historical fiction, author blogs, library sites and so on. I was attempting to remember my own responses whilst you were posting your reflections of the survey itself, and I’m still at a loss as to what I might have said! 😦 Therefore, its always a delightful surprise seeing how the survey participants answered!! GoodReads isn’t my go-to resource, but I do hope I earmarked off the Historical Novel Society – lovely site & I love the interactive features! I might have said Lauren Willig’s blog attached to her site for the Pink Carnation series, as she is always so very forthcoming about historical romances, historical fiction, and period dramas! 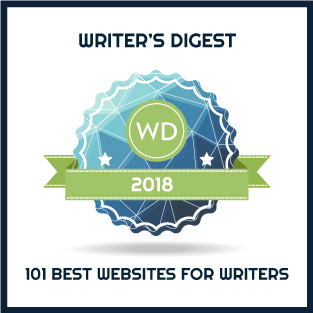 🙂 Of course, I might have made it more general and claimed ‘bookish blogs’ for which, I do spent a considerable amount of time outside of reading Ms. Willig’s blog & of course, the dear Word Wenches! Then, again, I could have elected to reference the Society (the Christian Fiction Historical Society). I suppose it would depend on what came to mind as I was filling out your lovely survey! All in all, the results are quite smashing! Lots of thirsty and healthy readers, that’s for sure! Now that I am on twitter, I was curious about the hashtags they look towards to finding historicals? Hmm,.. I opt usually for #historical or #historicalfiction or even #historicalromance if I am not saying a specific element like #Charlemagne or #France, #Regency or #Edwardian. I am also curious what hashtags to use. It seems the more general, the better. That is, I suppose, until you have a following on a specific one. Very helpful info. It is nice knowing where to go to meet writers.